The Aquasino’s scheduled 7 p.m. sailing tonight from Lynn Harbor marks the start of a new, locally run gambling boat operation still trying to obtain sufficient parking off Marine Boulevard. “We’re ecstatic we are finally sailing — we’re really pumped,” said Aquasino Chief Marketing Officer Jason Walsh. The 225-foot-long blue and white ship will make the 70-minute trip to federal waters with 300 to 400 passengers during its initial operation while Aquasino managers continue to negotiate parking arrangements. The ship has a 600-passenger capacity. Walsh said parking is reserved for passengers next to the Economic Development and Industrial Corporation pier where Aquasino docks. “Negotiations are going on. Everybody has been working with us,” he said. Owned by harbor entrepreneur James Walsh, the Aquasino has four decks featuring 250 slot machines, roulette, blackjack, Texas Hold ‘Em and other gaming tables. The ship sails from 7 p.m. to 12:30 a.m. tonight and its regular sailing schedule is 11 a.m. to 5 p.m. and 7 p.m. to 12:30 a.m. Wednesday through Saturday and 7 p.m. to 12:30 a.m. on Sunday. Ticket prices are $13 and an additional $20 for the buffet. Ship reservationist Ginny O’Leary said her ticket office phone started ringing as soon as she opened for business Thursday morning. “A lot of people are really excited. They’ve been saying, ‘We’ve been waiting for you to sail,’” O’Leary said. 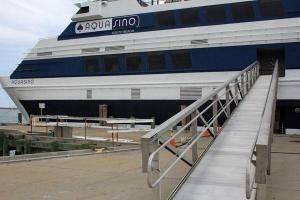 Lynn Harbormaster James Perry said Aquasino is good news for the city’s waterfront. “It puts a lot of people to work and brings in a lot of people,” he said. Aquasino is maintaining a regular sailing schedule through the July 4 weekend and O’Leary said people are calling or going online to reserve tickets. Online reservations are the easiest way to reserve tickets, said Jason Walsh. He urged anyone interested in taking a gambling cruise to check Facebook.com/AquasinoBoston for ship updates and announcements. “We want to make the customer experience really fast and easy,” he said. James Walsh unveiled Aquasino in March and the EDIC board of directors on April 23 approved a $200,000 loan to pay for pier improvements. Wash sailed the ship from Florida to Lynn in May, initially hoping to begin gambling cruises that month. Wrangling over parking and ship preparations pushed the sailing date to today. Jason Walsh on Thursday said the approximately 60 crew members assigned to each sailing are well-trained employees with prior job experience in their work specialties. He said Aquasino’s crew has taken the ship to sea on shakedown cruises, including one on Thursday. About 170 people will work on the ship or will be associated with the operation through vendor arrangements. Aquasino wants to use 200-plus parking spaces in a lot owned by National Grid next to the pier. Utility spokeswoman Deborah Drew on Thursday said talks between the gambling operation and National Grid are continuing. “We don’t have anything to announce at the moment, however, we are looking to see how we can assist with this initiative and continue to work toward an agreement,” Drew said. John Antonellis said he continues to talk to Aquasino managers about using 100 to 150 spaces owned by Elevator Interior Design, a firm Antonellis owns near the pier. “We certainly will work to accommodate them,” he said.